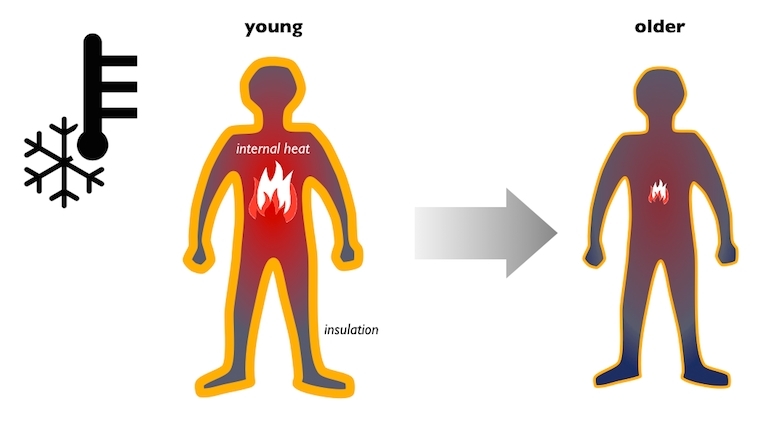 Some of the mechanisms we rely on to regulate internal temperature become less effective as we age. I’ll just post the cold conditions. They also discuss hot conditions. In an effort to defend body temperature, our bodies decrease blood flow to the skin to reduce heat loss. We also increase internal heat production through several mechanisms. One example is shivering—or the rapid contraction of muscles—which can quickly produce large quantities of heat within the body. But as we grow older, our bodies become less effective at controlling skin blood flow and generating internal heat. In addition, the layer of fat under our skin that acts as an isolator and helps to conserve body heat thins with age. 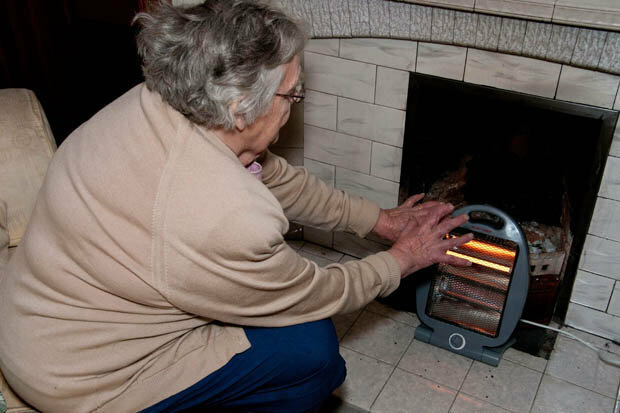 Because of these changes, it is harder for older adults to maintain internal body temperature in the “normal” range in cold conditions. Their recommendations are intuitive: raise the temperature of the room, wear more clothes, drink warm beverages. One they didn’t emphasize was to drink more fluid overall. We lose more fluid during cold conditions (see below), and as we age our thirst sensation decreases so we don’t replace lost fluid effectively. And adequate fluid is necessary to regulate our body temperature (thermoregulation). Nutritional Needs In Cold And In High-Altitude Environments: Applications for Military Personnel in Field Operations, National Academy of Sciences, 1996. 1. Cold-Induced Diuresis – We urinate more when we’re exposure to cold. It’s thought to be caused by movement of fluid from peripheral tissues to core when peripheral blood vessels constrict to keep the core warm. 2. Respiratory Water Losses – The amount of water vapor exhaled approximately doubles at -4 degrees F (100% humidity) versus 77 degrees F (65% humidity) (Despite high relative humidities cold air contains significantly less water vapor than does warmer air of even lower relative humidity.) The more one exercises in cold weather, the more vapor is lost. 3. Cold-Weather Clothing – Heavy or well-insulated clothing can trap heat and induce sweating to rid the core of that heat. Moderate-to-heavy exercise performed in clothing with high insulation can generate upwards of 2 liters of sweat per hour. 4. Metabolic Cost of Movement – Walking in snow versus a clear sidewalk increases our metabolic rate. Also, cold-weather clothing can be cumbersome and has been measured to increase metabolism by an additional 10 to 20%. Increased metabolic rate = increased water losses through lungs and sweating. 5. Reduced Fluid Intake – Voluntary dehydration (a reduced sensation of thirst) occurs when humans undergo stress. It occurs in hot climates and may be more pronounced in cold climates. Did you see that number 5? Reduced thirst sensation? Older adults already have a reduced thirst sensation. Add to that reduced thirst due to cold weather and they may never feel like drinking! 1. Physical and Cognitive Performance – Studies document significant reductions in muscular strength, muscular endurance, manual dexterity, coordination, and both aerobic and anaerobic work capacity, due to cold-induced dehydration. It has also been shown to reduce cognitive performance. 2. Thermoregulation – You can get too hot (because of reduced sweating) or too cold when dehydrated..
Orth (1949) provides a summary of the potential effects of dehydration on soldiers’ health and performance in cold environments: “The lack of sufficient fluids in the diet to maintain a positive water balance causes at first a change in disposition, sullenness, loss of appetite, chronic thirst, discipline begins to suffer … and finally failing physical efficiency. The final step is dehydration exhaustion, this can take place in 3–4 hours in the desert, but it also can take place in as little as two days in the Arctic where solid water abounds” (p. 205). Shivering? Irritable? Headache? Constipation? Fatigue? Inability to focus? You may not be drinking enough. Hot beverages, even if they contain caffeine, can count towards your daily fluid intake. 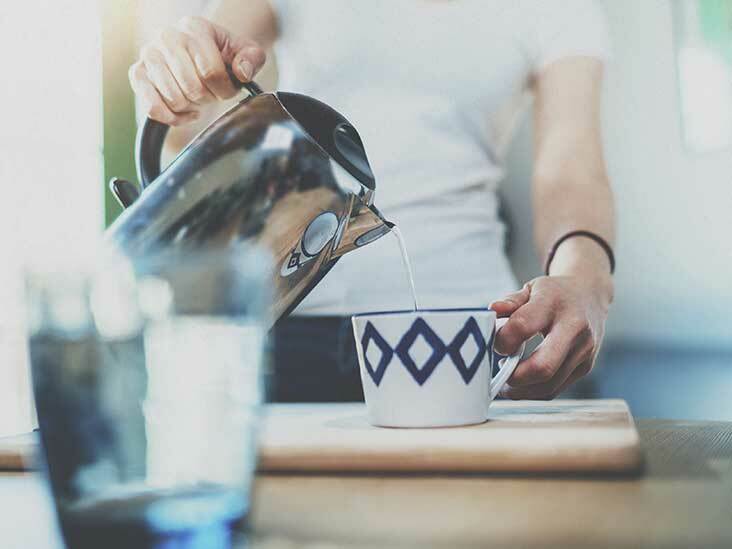 The diuretic effect of caffeine-containing beverages is weak and won’t compromise hydration. This entry was posted in Uncategorized on February 6, 2019 by Bix.